Jerod Morris, our VP of Rainmaker.FM, shares some lessons from what may be our most ambitious content initiative ever. It should always make you nervous when Copyblogger’s founder and CEO, Brian Clark, tosses an idea around. His ideas have a way of turning into “unyielding freight trains” of business energy. In this case, it’s the Rainmaker.FM digital marketing channel — the network of shows that includes Confessions of a Pink-Haired Marketer. Jerod’s Showrunner podcasting course with Jon Nastor will be closing to new students on Friday, August 14, 2015. If you want in, now’s the time! Voiceover: Rainmaker.FM is brought to by The Showrunner Podcasting Course, your step-by-step guide to developing, launching, and running a remarkable show. Registration for the course is open August 3rd through the 14th, 2015. Go to ShowrunnerCourse.com to learn more. That’s ShowrunnerCourse.com. Sonia Simone: Greetings, superfriends! My name is Sonia Simone, and these are The Confessions of a Pink-Haired Marketer. For those who don’t know me yet, I am a co-founder and a Chief Content Officer for Copyblogger Media. I’m also a champion of running your business and your life according to your own rules. As long as you don’t lie and you don’t hurt people, this podcast is your official pink permission slip to run your business or your career exactly the way you think you should. Today I am talking with my friend and colleague Jerod Morris, who has worn a lot of hats with us at Copyblogger Media over the relatively short amount of time he’s been with us. Are we calling you VP of Rainmaker.FM these days? Is that the latest? Jerod Morris: Yes, that is the current title. Jerod Morris: Also, by the way, as you were doing that intro, I realized that I want a little pink permission slip that I can put by my desk. Sonia Simone: I think I have to print them out. Jerod Morris: Yeah, just as a visual reminder of your empowerment. Sonia Simone: I think we need a printable PDF to go on the podcast. I think that would be helpful. Sonia Simone: There may be people listening to this who have heard my podcast or another podcast on the network, but they might not realize that my podcast is part of a larger network, which is called Rainmaker.FM. Do you want to just tell people a little bit about what the Rainmaker.FM project is? Jerod Morris: Sure. The short description is that Rainmaker.FM is the digital marketing podcast network. As far as we know, it was the first one. Certainly, it’s the largest one. Really, when you look at how it came about, obviously we have the Rainmaker Platform. We realized how big audio was going to be, and we had run The Lede. Brian and Robert had started doing the project for the New Rainmaker podcast, and it was going well, and we just realized that there was a great opportunity to create shows based on specific topics that the target market for the Rainmaker Platform would be interested in and that our people could speak about authoritatively. It was this great marriage between the trends and the emergence of on-demand audio and this product that we had in the Rainmaker Platform, and then the incredible people that we have to create content, so it all merged together into Rainmaker.FM. We just, a couple of weeks ago, actually, passed a million downloads already. Jerod Morris: Yeah, it’s been going quite well. Jerod Morris: Yeah. A little idea that has just become this unyielding freight train of weekly content. Sonia Simone: That would be a good tag line. I want to talk about some of what you’ve learned on the team behind the scenes as we have launched and we have evolved. Copyblogger Media is not a big company. I don’t know how many folks we are now, in the 40 to 50 range, because we’ve got some part-timers and some freelance people. We had to learn a lot about running a big and a big multi-part project like this. We can start with what we had in mind as a company to accomplish. We wanted to promote the Rainmaker Platform, but what was that original vision for the project? What was the original business case for it? Jerod Morris: The original business case was that we saw where things were going with audio, and we knew that we had, internally, the ability to create these audiences around these topics, and that as we did that, as we built these audiences, we would be talking to the exact types of people who would be good fits for the Platform. It’s very important that we didn’t just start this as a vanity project. It has definite, real business goals associated with it, and if it’s not leading to people registering for the Rainmaker Platform, then it’s not something that we can keep doing, because there is a clear investment of our scarce resources of time, of money, of energy to make this happen, and we could all be doing other things. It was a pretty big bet in that sense, and certainly a little scary and a little risky, but I think the fact that it’s a lean team but it’s a very capable team with pretty defined roles on the production side, that’s really helped us keep it going. Really, there was a lot of room for potential error, for potential struggles there. I think the fact that we cloned Robert and that we have five of him is awesome. It’s disappointing that one of them isn’t on New Rainmaker anymore, but, you know. Sonia Simone: Yeah, right. Exactly. Jerod Morris: He and Caroline and Clare and Kelton and just everybody who’s really rallied together to make it work on just that daily basis … Because that’s the thing, and you realize that when you do a podcast. Even if you’re just doing a weekly podcast as one person, it’s incessant. It keeps coming, and you’ve got to feed that beast, so to speak. Fortunately, we’ve been able to do that, and I think a lot of the business reasons for doing this have proven themselves out, and so far, it’s been successful. Sonia Simone: Yeah. This is by far, I would say, the most process-driven project we’ve ever done in our company, at least outside of the actual software development teams. They have their own processes, but on the content side of things, we have never been this formal in terms of how we handle the process. Do you want to talk about some of the things that you’ve learned about either working with a team, or working with process, some things that surprised you or were different from what you might have done in the past? Jerod Morris: I think there is a real humility that you have to have when you’re working in a team environment like this, when you’re dependent on three or four different people to get something out. That’s the one challenge with a podcast network that’s different than just running your own podcast. I’ve run several podcasts, but I could also do everything last minute if I wanted to. We can’t really do that here, and if one person feels like they can, or goes last minute and gets their audio in, well now the entire production team is scrambling. Then, obviously, if a few people do that, now you’re really in trouble. Robert did a great job of really defining “What will the exact process be?” From the email that hosts send to where the audio files go, every little detail was there, structured for people to do. That’s what has allowed us to scale it up to a certain extent — to 15 to 20 shows — and makes us feel comfortable with it so that as we add new shows, we’ll be able to fit them in. It still relies on individual people being responsible and recognizing the work other people are doing and getting their stuff in early and on time so that production doesn’t stop or come to a halt or get delayed. Look, there’s always going to be stuff that happens, and every now and then, something’s not going to go as you planned it, but for the most part, that’s really worked well, and it’s been essential for the network running as efficiently as it’s needed to. Sonia Simone: Yeah. In a lot of ways, we’re a company of solopreneurs. We’re not great with rules. Jerod Morris: That’s a good way of putting it. Sonia Simone: We’re not awesome with structure. This has been a little outside the comfort zone of most of us, and me maybe more than many. Like you were saying, when you do it yourself, you get used to just doing it right at that outside edge of when you can get away with doing it, and then you just maybe pull a little bit of a late night, do your edit, get it going, and coast in. Like you used to do in college, right? Sonia Simone: Finish printing your paper 18 minutes before you had to walk to class, that kind of thing. Yeah, it’s interesting. Jerod Morris: An interesting thing has happened, too, because on just some of my personal projects that I do outside of the network, since we started the network, I’ve made those much more process-oriented. I’ve really seen the benefit of doing that. Like you said, I tend to be resistant to that, and it’s really, in a lot of ways, silly thinking that I’m trying to shake myself of, because when you do have good systems, it allows you to be more consistent, and it allows you to worry less about the ‘how’ and the ‘when’ you’re going to do things and then just actually get in there and work on the ‘what’ and the ‘why.’ That ends up leading to much better content, much more consistent content. It’s been both educational and inspirational to me from that sense that I’m trying to apply in other areas, too. Sonia Simone: Yeah, I agree. I think it’s been a fascinating experience for us. I feel really good about the shows. There’s such diversity, and yet there’s a cohesiveness, I think, of voice, because we do have really strong company values. I don’t want to brag on our project, but I think it’s pretty cool. Jerod Morris: I do, too. I think our best resource has always been our people. I think that’s been my favorite part about it, is obviously Demian and I were doing The Lede, so our voices were out there in terms of podcasting, and Robert and Brian started doing New Rainmaker, but there’s so many other people that have interesting things to say and experiences to share and journeys to take people on, and now they’re getting a chance to do that, and it’s wonderful. Sonia Simone: Yeah, I agree. It’s been exciting to watch. I talk a lot, I teach a lot, about podcasting. It’s the biggest ‘new thing’ to come since, I would say, blogging, in terms of building an audience, developing an audience, finding new people who want to know more about who you are, what you do. But we have the same issue we did with blogging, which is that people think they’re going to start that blog or they’re going to start that podcast or they’re going to open their Pinterest account, and then there’s going to be this flood of traffic, this ‘build it and they will come’ kind of philosophy. The massive audience never hits unless you already have a best-selling book or you already have a big audience. It never hits right away, is how I should have completed that sentence. You have been here before. You have built audiences from scratch. I have built audiences from scratch. We didn’t cut our teeth on the big audience at Copyblogger. We both have been down these trenches before. Can you talk a little bit about the long game, about how to keep yourself going? Because at first, it takes some time to build the audience. Jerod Morris: It does. Sustainability is so important. We talk about this inside of the course, the importance of showing up for the first time. Obviously, you have to show up and be there. Then you’ve got to do it reliably, and you have to do it reliably over time. That consistency, every time you set that expectation and deliver on it, a little bit of trust is built. Every time you set the expectation and don’t, a little trust erodes. The only way to build a meaningful relationship with an audience over time is to build meaningful relationships one-on-one with readers and listeners, and they add up. I was just listening to a podcast earlier today. Hat-tip to Cliff Ravenscraft and his latest episode of Podcast Answer Man. He had recorded his presentation that he did at Podcast Movement. He was talking about how so many people come and ask him, “How do I get my next thousand listeners?” always looking ahead to traffic, and he said the thing that people forget — and I agree with this wholeheartedly — is they forget about the people that they have and nurturing the audience that they already have. We get dissatisfied with the five people who listen, and we worry about the next 100 instead of really nurturing those five and building raving fans and giving them as much value as we can and helping them, always looking next, next, next. I think if we can really just focus on doing it brick-by-brick as opposed to trying to just go viral and cast this huge net, I’ve always found it to be much more rewarding when you do it slow and steady. Now, eventually, it’s nice to have those viral moments, but it’s great for that to come when you already have a foundation of people who really know you and trust you, and I just don’t think there’s a shortcut to doing that when, as you said, you’re starting from scratch. Sonia Simone: Yeah, and I have a Yogi Berra-ism that I think I coined, which is, “Don’t take shortcuts. They take too long.” Because I’ve seen it, people who try and take the shortcut to the big audience with some system, something that somebody sells you that promises you X number of social media followers or X number of podcast subscribers or whatever it might be, that you can do some trick to make it happen quickly. And you just see those people, and they’re restarting their engine again and again and again. If they had just gone about it one at a time, starting the way we all do, they would be there already. Jerod Morris: I’ve talked about this before. The biggest regret of my online content career is that back when I was running Midwest Sports Fans, I was always looking for viral traffic and to drive the big numbers that day, instead of actually building an audience and building something lasting and meaning. Because when you do it that way, like you said, you’re almost always starting over, and that’s not meaningful. That can have short-term success, but I just don’t think it’s going to build you value for you or anybody else in the long term. Sonia Simone: That’s been my experience, 100 percent. You mentioned a course, and you have a course. As the timing happens, you are taking some students on for this course right now, and you will be for the next couple of days when this airs. Do you want to talk about what the course is, what people might be able to get from it, and then what they should do to get involved? Jerod Morris: I would love to. We’ve been having so much fun with the course. It’s called The Showrunner, and it’s the podcasting course that’s associated with our show on Rainmaker.FM, The Showrunner, which is basically our podcast about podcasting. The goal of the course really is to give folks a step-by-step guide for how to develop, launch, and run their show and really take them through the step-by-step process. It’s more than just tactics and tools. There’s a lot about mindset, because I think our big idea when we launched The Showrunner was to help people break out of this idea that they’re just producing MP3 files, that they’re just a podcaster, that they’re trying to attract listeners. We really want people to look at their podcast as something bigger, to really tap into the power of audio to create a connection and to tell stories and to take an audience on a journey and something really transformative that doesn’t just attract listeners but that really helps you build an audience and build a connection that can have impacts for you personally, for your audience personally and professionally, and help you drive results for whatever your business is. Because at Copyblogger and at Rainmaker, that’s what we’re teaching people: how to succeed and not just create great content, but create great content that leads to a result. That’s what we really try and do inside of the course. The four pillars of our curriculum are authenticity, usefulness, sustainability, and profitability. If you want to create something remarkable in any form of online content, but especially podcasting, it’s those four elements. We really try and walk folks through what each of those elements means, how you actually go about doing it, and then where that can lead. We’ve been having a blast with it. Probably the biggest surprise about the course has been the power of the community inside of the course, which probably shouldn’t have surprised us as much as it has. But it’s like anything, the people have just made it and taken the ‘showrunner’ idea and what the course can be to another level. It’s the kind of place that, if you haven’t started or if you’re experienced, you can really find a fit, because there’s information that’ll be relevant. And then there’s people that are there going through the same things, that are there to offer support, answer questions, relate on certain experiences. As I’m sure you found out and you know from past experience, too, doing a podcast regularly, it can go really well for a little while, and then there’s that day when you get behind the microphone. You get that some with writing, but writing feels to me a little bit — maybe this is just me — but I feel a little bit less exposed when I’m writing than when I’m recording, even if it’s not a live recording. To me, there’s something that’s more vulnerable about that. We found that people really like having that place where they can go, get support, get a little ‘rah-rah’ every now and then. And then when it’s combined with really good information that helps them take the next step, we’ve been seeing good results. We’re really excited to work with the people we have. Like you said, it’s open until the 14th, so Friday, and then we’re closing it down again to really focus on the people that are in it. It’s ShowrunnerCourse.com for people who are interested and who could use something like that. Sonia Simone: I have found so much value in a community of people trying to do the thing that you’re trying to do, whatever it might be, if you’re trying to do something challenging. Business is challenging, and digital business — the way that I look at is that there’s a million things that you have to figure out. None of those things is outside your ability. They’re all things you can learn, but there’s so many of them. It gets really overwhelming. It just seems like you go through all these different things, and you learn all these things, and then you look up, and there’s still so much to do. It gets really hard. For me, that community support and having somebody walk you through the process is important so that you don’t get so hung up on buying a mic that you never go beyond that, or don’t you get so hung up on trying to figure out something about iTunes that you never ship. For me, a community and an instructor, a leader who can say, “Okay, it’s time for you to be focusing on this now,” I find that very valuable, and I think other people do, too. So I think it’s very cool. Jerod Morris: We all, in all of our projects, will struggle with motivation or come up against something rough. Maybe we can go to a significant other or a friend, and they’ll pump you up and, “Hey, you can do this. You can do this,” but there’s a difference when it’s, “You can do this. Oh, and now go do this,” like, “This is what actually works.” Then you have that next step that helps you build the momentum, and it gets that positive momentum going. That’s really what we want the course to be, and so far that’s what it’s been. Sonia Simone: Very good. All right, well, we’re kind of at my sweet spot here, 20 minutes, so I’m going to give people that food for thought. I would recommend, if launching a podcast or maybe growing your podcast, improving your podcast is on your list for this year, this is a really solid resource. I think it’s going to help you out a lot. Will you remind people of the URL so I don’t fluff it? Jerod Morris: Yes, it is ShowrunnerCourse.com. Nice and easy to remember. ShowrunnerCourse.com. Sonia Simone: Fantastic. Sweet. Well, thank you so much for the conversation today. Always good to talk to you. Jerod Morris: Thank you, Sonia. The thing about your show, you always give such great information, but all people need to do is listen to the intro, and they get a useful nugget right there, because it reminds you of those great inspiring words. It’s a pleasure to be on here. Sonia Simone: That’s right, that pink permission slip. Just a reminder for everybody, the Confessions of a Pink-Haired Marketer are in fact brought to you by the Rainmaker Platform, the complete website solution for content marketers and online entrepreneurs. Find out more, and take a free 14-day test drive at Rainmaker.FM/Platform. Thank you, Jerod, and thank you all for your time and attention. I never take that for granted. We will see you around. Take care, everybody. No love for Webmasterradio.FM, Jared? They even have a podcast there called Rainmaker! One of my favorite pod from WebmasterRadio is PPC Rockstar. 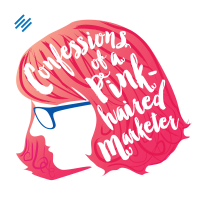 One of my favorite podcast at Rainmaker.FM is Confessions of a Pink Haired Marketer!